October 17, 2015 – The sweeping mosaic above is made from the highest-resolution images that NASA’s New Horizons spacecraft will return of Charon. This view extends from the limb at left to the terminator, or day-night line, at right. From the left, the view moves from rugged cratered terrain, across the great faulted canyons of the Serenity Chasma, and onto the resurfaced plains of Vulcan Planum, both informally named. The expanded view of Vulcan Planum at bottom, with its rilles (grooves or long, narrow depressions) and intermittently spaced impact craters, highlights a landscape reminiscent of the volcanic plains on Earth’s moon (lunar mare). 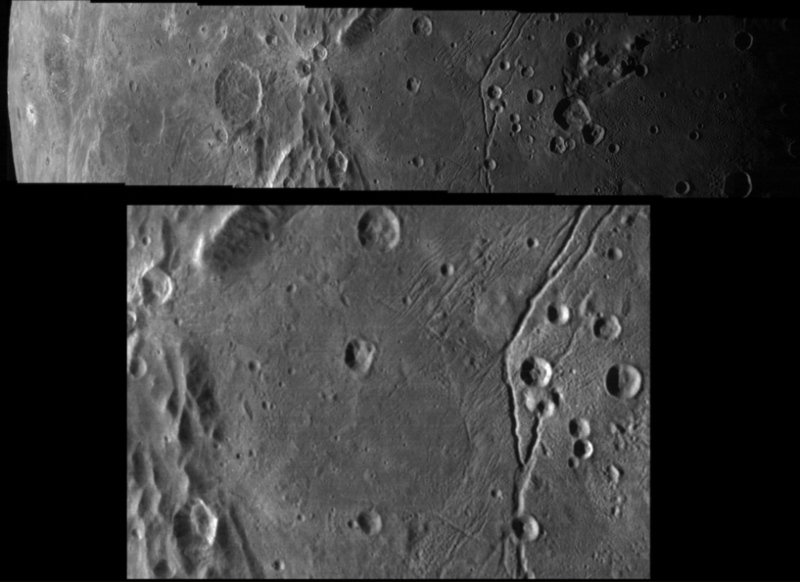 However, while the lunar maria are made of basalt, these plains on Charon consist of water ice.